The cyclist and car are heading in the same direction with the cyclist in front. The car runs into the rear of the bike. This can often happen if the cyclist has to drift to the center of the lane from the right part of the lane due to parked cars or doors opening on the side of the road (see theDoor Jam). Consistently ride more to the center of the lane so you don't take the driver by surprise. Do not shift to the center of the lane unless you are positive it is clear. If the car simply runs into the rear of the bike it is almost absolutely the car's fault. 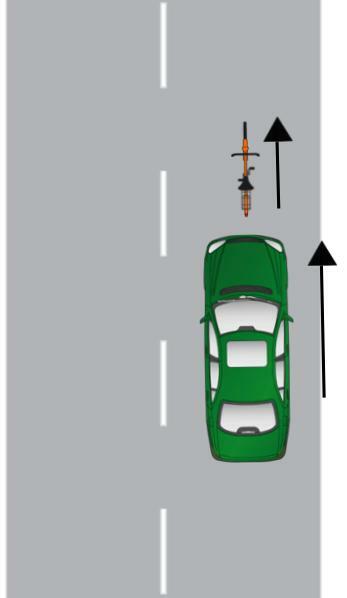 However, if the cyclist has shifted in front of the encroaching car it is possible that a jury could determine that the cyclist was partly to blame for the collision.